There were a lot of comments about eagle growth rate on Facebook this morning. According to Gary R Bortolotti, bald eagles may gain more weight per day than any other bird in North America. As in other animals, different body parts may reach adult size at different times. The growth of the legs will be complete about half-way through the nesting period, but the beak and flight feathers won't reach adult size until after the eaglets have fledged, or left the nest. In fact, an eagle's juvenile flight feathers are longer than its adult flight feathers, which it won't get until it is 3 - 4 years old. 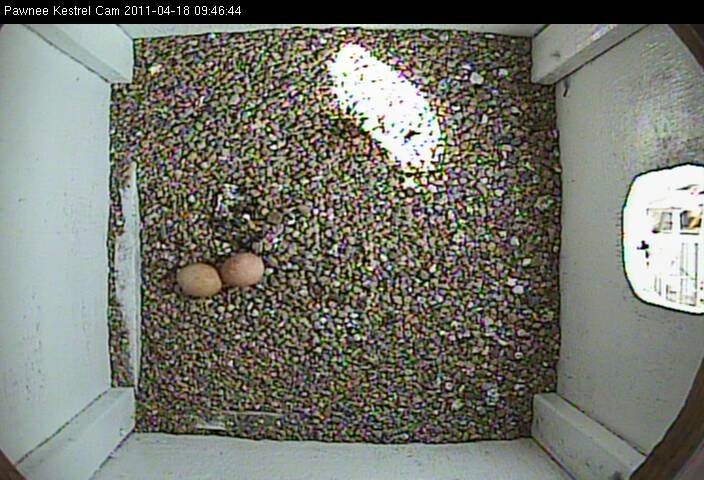 The kestrels have laid a third egg. The photograph of the female kestrel clearly shows what I've heard called her "eye spots". Although no one knows for sure why she has them, the most commonly accepted theory is that they help frighten attackers away. Unlike falcons and eagles, she should lay a bunch of eggs, although not all of them will hatch. Again, unlike falcons and eagles but like many other birds, kestrels are sexually dimorphic in plumage - males and females have different plumage. Wikipedia reports that plumage has more variation between the sexes than size. Click on the picture for a larger view. The Decorah eagle babies seem to have gotten off to a nice start today - thank goodness the bad weather is gone! Despite today's snow, ice, and rain, the eagle family is doing fine. The parents were very careful to keep their babies sheltered. You can see Mom holding her wings out and up to keep the rain and snow from her young. The bowl of softer materials that the eagles built in the larger nest also helps keep the babies away from the wet. I hope this is the last snowstorm the eagle family faces. Eagles incubate for roughly 34-37 days, according to a number of online sources. 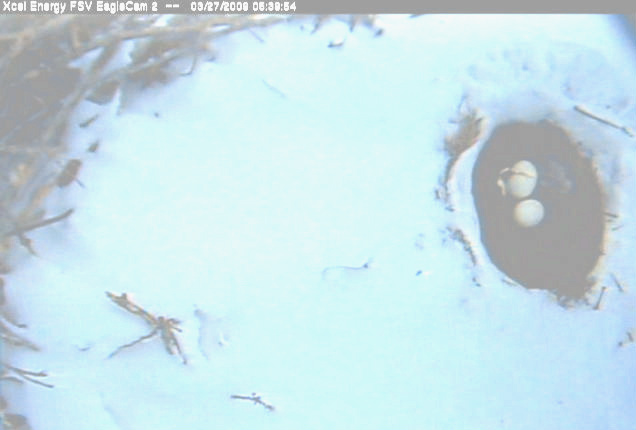 Last year, the Decorah eagles laid three eggs: one on February 25, one on February 28, and one on March 5. 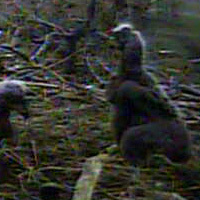 The first eaglet hatched on April 3. This year, the eagles started laying eggs a little earlier, but had the exact same spread: February 23, February 26, and March 2nd. As cam watchers have observed over the years, eagles incubate during some very difficult weather. The eggs are laid in a cup of grasses and other soft material (including corn stalks) that raise them above the "platform" of the larger nest. This insulative cup helps retain the heat of the adult eagles and provides additional protection from rain and snow. It also helps keep eggs from breaking (sticks and branches provide a hard, irregular surface) and is nicer for the adult eagles to incubate eggs in - at the risk of being anthropomorphic, I would prefer a bed of soft grasses to one of hard sticks any day. I suspect the eagles feel the same way. Some websites state that both male and female eagles are involved in building the nest, while others state that it is usually the female who places branches in the nest. In our experience, both the male and female eagle are involved in building the nest. Bob has observed that nest building is part of the eagles' courtship ritual: bonding begins with courtship and continues through nest building, copulation, incubation, and raising young. Both eagles bring sticks and nesting material in, both place sticks and material, and both move the other eagle's sticks around. So who incubates more: the male or the female eagle? The female eagle incubates more, but the male shares incubation duties as well. This is not the case in all birds or even all raptors: the female owl at Valmont, for example, does all of the incubation duty. In addition to sitting on the eggs, both birds also roll the eggs. This helps assure that all parts of the egg receive heat and prevents the developing embryo from sticking to the egg shell. The parents are very careful not to puncture the eggs with their talons and sometimes "ball" their feet to keep from damaging them. The eaglets are altricial. According to wikipedia: "In bird and mammal biology, altricial species are those whose newly-hatched or -born young are relatively immobile, lack hair or down, and must be cared for by adults; closed eyes are common, though not ubiquitous. Altricial young are born helpless and require care for a comparatively long time." The eaglets are not able to thermoregulate, or control their body temperature, until they are 10-14 days old. During this time period, the eagles (usually but not always the mother) stick very tight to the babies. On a warm day you may see the baby eaglets exploring the nest, but on a cold or rainy day, they will be sheltered under a parent or two. The eaglets will go through a number of physical changes as they grow. On hatching, they will be covered with a light-colored down that is uniform in color. The baby down will be replaced by a darker, medium-grey second down when the babies are between 9 and 11 days of age. Juvenile feathers will start to appear when the young eagles are around 24 days of age. These feathers will be dark, since eagles don't develop adult plumage (dark body, white head) until they are around three years old. The color of the eaglets' beaks and talons will also change as they grow. Birds grow very rapidly and, according to Gary R Bortolotti, bald eagles may gain more weight per day than any other bird in North America. As in other animals, different body parts may reach adult size at different times. The growth of the legs will be complete about half-way through the nesting period, but the beak and flight feathers won't reach adult size until after the eaglets have fledged, or left the nest. In fact, an eagle's juvenile flight feathers are longer than its adult flight feathers, which it won't get until it is 3 - 4 years old. On 3/11/11 I made my first of many big river surveys for falcons on cliffs. My first stop was under Leo's Bluff near Waukon Junction, IA. I was pleased to quickly locate two adult falcons back at this cliff. I saw the adult male falcon strafe a young BE sending a stream of feathers raining down. This is one of the better cliffs on the Mississippi River to watch and hear the courting falcons. The road down below this cliff has the least amount of road traffic and least amount of trains. I then went to the Bunge North America grain elevator in Mc Gregor, IA. I found two adult falcons on site. The adult male up near the nest box and the adult female perched on a nearby cliff face. I stopped in the office to make sure they were aware that the falcons have returned. I was told that they knew the falcon were back because one of the falcons was quite vocal. I've never heard of this complaint before. Before I left the site I parked my car directly under the adult female perched on a dead snag on the cliff face. The falcon was wailing and she is indeed quite loud. I could still hear her after driving around the corner of the cliff and all the way to the elevator office. I stopped back in the office and told everyone that this wailing sound that is part of courtship behavior and should end soon. I crossed over the bridge to Prairie du Chein and made my way upstream. No falcons at the small lock and dam #9 cliff. I did find two adult falcons at the Lynxville, WI cliff on the northern cliff. I continued my way upstream and crossed back over the river at the Lansing, IA bridge. No falcons at the Guider's Bluff, formerly known as Dead Cow Bluff. I contacted the owners of this cliff as some people have also called this Achafalaya Bluff. Mrs. Guider was home and I asked her if their cliff was also known as Achafalaya Bluff? She told me that she has never heard this name before and it has been in the family for 70 years. So, it appears that the power plant cliff just a short ways downstream is indeed also known to be Achafalaya. I did find one falcon at the power plant cliff that from now on should be called Achafalaya Bluff. Returned home 186 miles. I set off again on another river survey on 3/13/11. Started out at Lansing, IA and made my way upstream. No falcons seen at Princess Point near Reno, MN. No falcons seen at the Brownsville overlook cliff. No falcons seen at the Shellhorn cliff. Saw one adult falcon at Great Spirit Bluff near Dresbach, MN. I found two adult falcons at Queen's Bluff aka The Bandshell. This was the first Minnesota cliff overlooking the Mississippi River to fledge a young falcon. The adults at that first nesting season were two falcons that we captive bred and raised in a rock line room to help imprint them to cliffs. Both of those adults are now long gone and have been replaced but in our hearts we will always know just how falcons came to first nest on this cliff. Heading upstream as I approached the little burg of La Moille, MN. I could see the large cliff face of Trempealeau, WI. Someday we will have falcons on this cliff as it towers directly over the main channel of the river and several times now I have seen falcons here. Sadly, no falcons again at the Homer, MN cliff. I stopped and met with the owners of this historic falcon nest site. Turns out they have been one of the many followers of the popular RRP BE Cam. We discussed installing a nest box on the cliff face to improve odds of attracting nesting falcons. 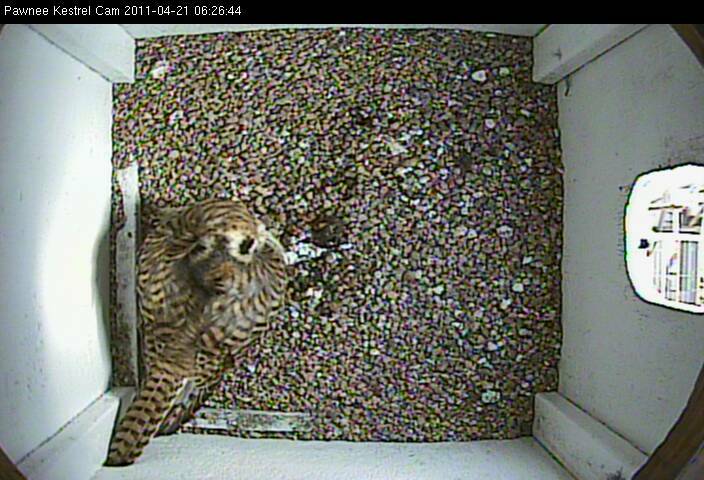 I stopped at Bay State Milling in Winona, MN and found one falcon back on site near the nest box. Crossed the river in Winona and parked for about 45 minutes under Castle Rock, a lovely cliff about a 1/2 mile upstream from the bridge. 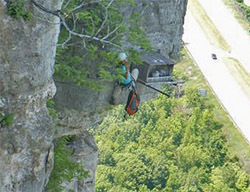 I did not see falcons on that visit but Gary Grunwald reported two falcons courting over this cliff a few days before. Last year we had two falcons at this cliff before they moved off and it was sad to see this cliff that has had nesting falcons on for so many years sit empty. Hopefully we will have a successful nesting pair this year. No falcons seen at Indian Head or Fountain City. I did notice that the perch on the front of the Fountain City nest box is broken and we will need to rappel down to make repairs. I now use wooden closet rods for perch material as it is much more durable than using treated 2X2 boards. As I approached the south end of Alma, WI I saw a male falcon fly from the nest box up on the stack to 12 Mile Bluff cliff directly across from the plant. He flew back and forth across the cliff indicating to me that he was courting a female. I stopped for a few minutes and located one falcon perched in a tree up cliff top. Spent a few minutes at the Alma Marina cliff where falcons once bred in the single pot hole on the cliff face. There were about a dozen eagles flying all around the face of this cliff. No falcons. Met up with Gary Grunwald at his home directly under Maassen's Bluff. He has not seen falcons as of this writing but will call as soon as he does. We have had territorial pairs nesting at this cliff for many years. However, last year there were two falcons on site but just before what would be egg laying time they disappeared. Can only hope 2011 is productive. No falcons at Maiden Rock or West Bluff. Lake Pepin was still locked up in ice. This should break any day now. I crossed the river again at Red Wing, MN and stopped by Red Wing Grain. I could easily see a falcon at the new nest box. This is a new falcon nest nest box design that I constructed and supplied to Red Wing Grain. When you open the top up to the nest box the front is blocked off. No more worrying about the young falcons falling out and no more having to hang out in space holding something out front to keep the young falcon towards the back of the nest box when being pulled for banding. It was great to be back on the river. Soon we will need to inspect our ropes and gear for another banding season. I will make another river survey this next week. The Decorah Eagles laid their third egg today! PeggyJean posted this nice closeup. In his book "Oology and Ralph's Talking Eggs" Carrol Henderson discusses egg shape. According to Henderson, there are four different general shapes: elliptical (including round/spherical), pyriform, oval, and subelliptical. There are short, medium, and long categories within each, so 12 basic shapes are possible. Bald eagles lay oval eggs that are about the size of a tennis ball, as you can see here. This is the most common shape (Henderson refers to it as the default shape) that are probably most easily formed in the egg as the egg passes through the oviduct. "The fertilized ovum and yolk are released from the bird's ovary and then enter a portion of the oviduct called the magnum. There the egg white, or albumin, is added around the yolk. In the next portion of the oviduct, called the isthmus, soft inner and outer membranes enclose the egg white. Finally the egg, blunt end first, enters the uterus for an extended period of time where the shell is formed. The pigments (porphyrins) that create colors and patterns on eggshells are produced by the breakdown of hemoglobin from ruptured blood cells...Pigment oozes through the lining of the oviduct and onto the forming shell. 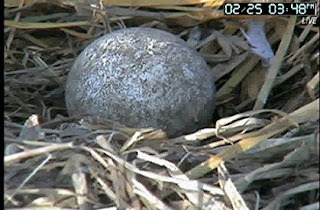 Depending on how the egg is moving or twisting in the oviduct, this process results in the creation of spots, streaks, and blotches, with most markings usually at the larger blunt end of the egg." Of course, shape and color can also protect eggs. Pyriform eggs have a tapered shape (image found on internet). This helps the eggs pack neatly into a nest for incubation, since the pointed ends all face the center; lessens the change of the eggs falling from a ledge, since the eggs roll in tight circles, and may help emperor penguins keep their eggs located on their toes. 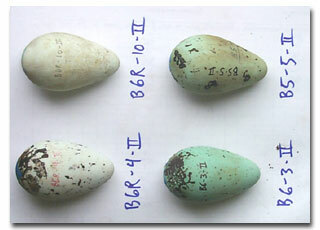 While I think of eggs as being white, color and markings can help make eggs less visible to predators. Some birds even camouflage their eggs with down or vegetation to hide them. In Decorah, the male and female eagle will take turns incubating their three eggs until they hatch on roughly April 1st (it could be a little later, since incubation takes roughly 35 days). This will keep the eggs warm and help protect them from predators like raccoons. 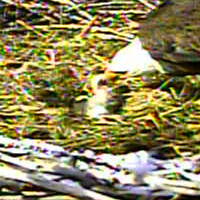 The parents will roll the eggs - something we've already seen - pick at the nest, doze, and eat. They will be very busy once the young eagles hatch! 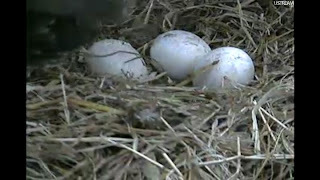 Here's a video of the third egg being laid. Thanks to the many Raptor Resource Project forum members who collect and post photographs and videos.